Some days at work are pretty mundane. Students pay attention to what I’m saying. Or they don’t. Students do the activities I ask them to. Or they don’t. Blah blah. And I go home. But other days are anything but forgettable. For example, less-than-glamorous but nonetheless heartwarming moments when students approach me before class begins to ask follow-up questions about previous lessons or vocabulary clarifications stemming from TV shows they’ve watched in English. 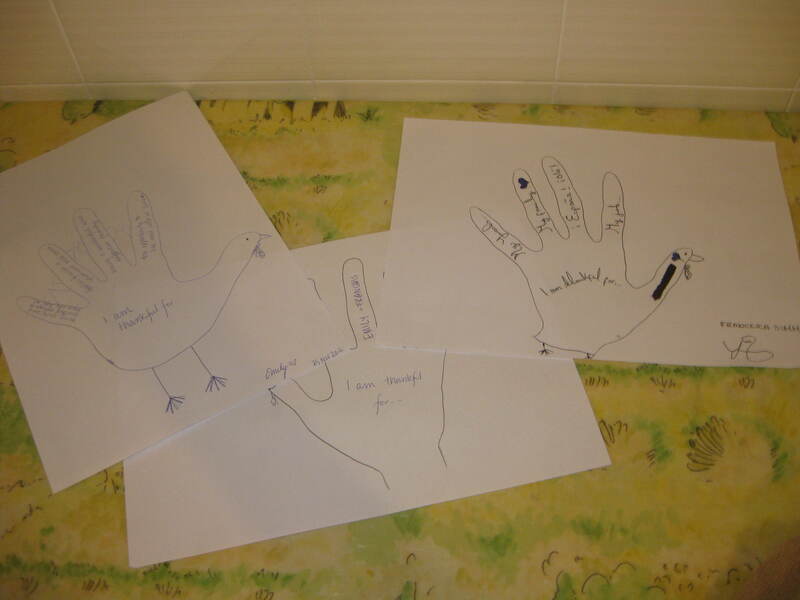 Or when a troubled and often disruptive student in primero de la ESO (7th grade) diligently works on his “I am thankful for…” hand turkey and actually has things to be thankful for. Or when a student in segundo de la ESO (8th grade) tells me that sleeping is a Spanish Olympic sport. Or, more theatrical moments, like when a boy in primero de la ESO performs an incredible a capella rendition of Aretha Franklin’s “Respect” in front of the whole class (to a resounding round of applause and requests for him to perform Adele’s “Rolling in the Deep” next, which I’ll have to hear one of these days…). Or when, while playing a modified version of Scenes from a Hat with my students in Ampliación de Inglés in segundo de bachillerato (an extra optional English class that focuses on conversation, available to students in 11th and 12th grade), one student writes the line “I think I’m in love with my English teacher.” Or when another student confuses “cat” with a synonym for “cat” that has a very different double meaning, a meaning which enough students understand to make for a good solid three minutes of can’t-speak-can’t-breathe laughter from the teacher, students and myself. Our lone defenders of eating turkey on Thanksgiving, complete with a spoof on the traditional Nike ad. The word “bien” remains in Spanish because, according to one student, “it is directed at the Hispanic population in the United States, just like what Obama did to win the election…” Can’t really argue with that…. Slogan: Some day, the roles will be reversed…TURKEY REVOLUTION! This group thought the idea of tofurkey was hilarious and decided to include it in their ad. Slogan: Put yourself in their shoes…and (it) will give you goosebumps! 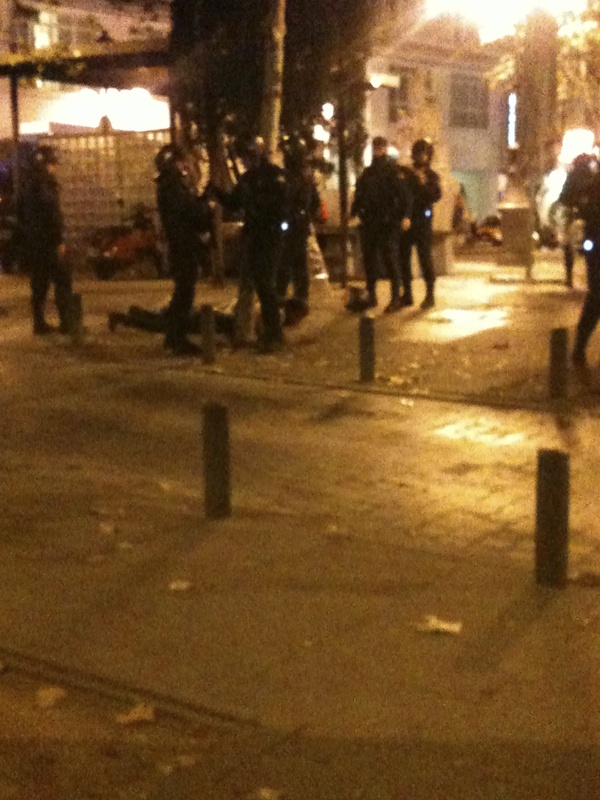 This was actually my second Thanksgiving in Madrid. Two years ago, I spent the American holiday in Spain’s capital with my parents and brother, eating paella and drinking sangria in a fancy restaurant. A few weeks later, I teamed up with my fellow americanas back in Sevilla to make a traditional Thanksgiving feast for our host families, complete with a full roasted turkey, all the fixin’s, and a delicious cultural fusion of apple cider and sangria, all followed by Salomé’s rum cake whose effect could beat tryptophan any day. 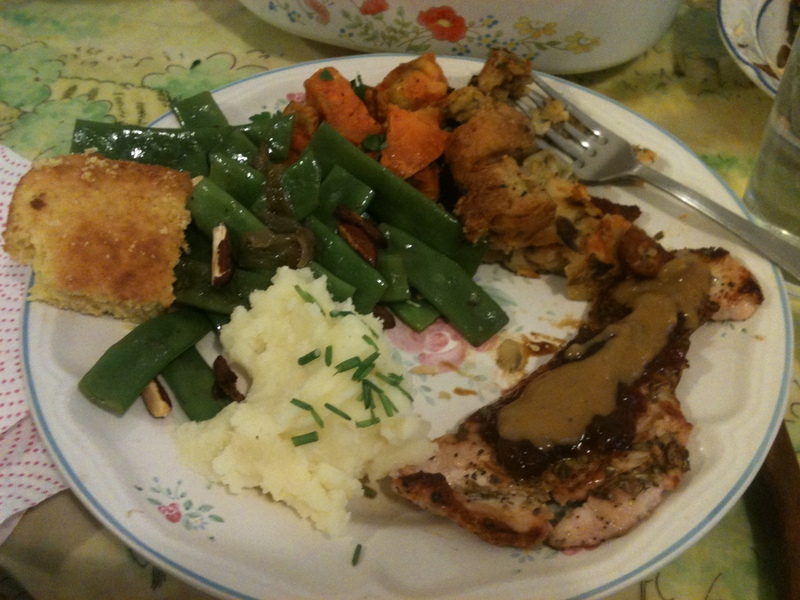 In 2011, I was back in the good old U S of A for turkey day, and for the first time, due to familial circumstances, was able to contribute significantly to the meal. I took on the role of family pastry chef, making a chocolate pecan pie, white chocolate cheesecake with a hazelnut cookie crust topped with cranberry compote, and pumpkin cupcakes with maple bourbon cream cheese frosting. This year, I find myself back in Madrid celebrating the Pilgrims’ first successful harvest. The circumstances wouldn’t allow for a comparable showing in the dessert department, but they would allow for me to make a Thanksgiving dinner for some friends who had never celebrated it before. Thursday itself was all but ceremonious, but today, after trips to numerous grocery stores, a specialty spice store to purchase sage, and an American grocery store to obtain cranberry sauce, I was able to prepare the traditional feast for a few friends. The menu included: cornbread, roasted garlic mashed potatoes, stuffing with chorizo, honey glazed roasted sweet potatoes, and green beans with caramelized shallots and toasted almonds. For the gobbler, I went with turkey breasts, pan-fried with traditional Thanksgiving spices in some delicious Spanish olive oil, and topped with homemade gravy and Ocean Spray cranberry sauce (the raw berry doesn’t exist here). I have to say, pan-fried turkey breasts are a big upgrade from the dry, tasteless roasted bird, and I’ll have trouble going back. 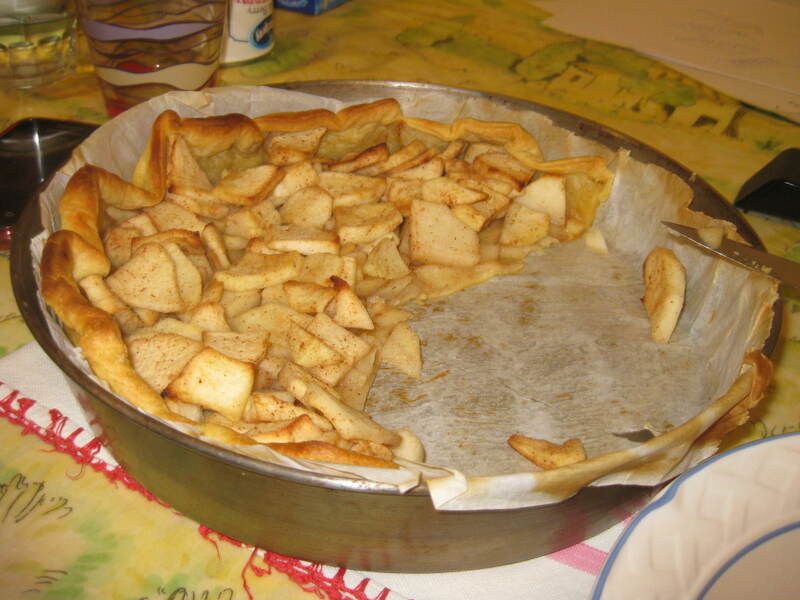 Being a baker rather than a chef, I was a bit nervous about being in charge of all of these savory dishes, but in the end, the main course was much more successful than my apple pie, which my guests enjoyed but I found too different from the classic for my liking. We even decided to channel our inner schoolchildren and do the same activity that I’ve been doing with my students all week: hand turkeys! Although it was a bit rough being away from home on this family-centered holiday, I certainly have a lot to be thankful for this year. Background: Today was the 14N Strike across Europe — general strikes in the worst-hit countries (Spain, Portugal, Italy and Greece) and partial strikes in some of the other Eurozone nations. This is the second general strike in President Mariano Rajoy’s crisis-stricken less-than-one-year stint in office. Although planning for the strike has been in the works for some time, emotions were especially high here in Spain, where unemployment rates are so high and austerity measures so severe that a woman recently committed suicide as she was facing eviction from her home because she couldn’t pay her mortgage. Today’s strike featured extremely limited metro and bus services, canceled flights at Barajas, closed shops and restaurants, blocked streets, protests, vandalism, arrests, and the participation of approximately 75% of unionized workers. While I encountered mixed feelings about the utility of the strike from various Spaniards, there is a general sense of unity among the people, regardless of profession or political affiliation, that something must be done to change the current situation. For many, the most obvious and direct action to take was to participate in la huelga. At first glance, a “strike day” is just like a “snow day” without the snow — a day when you can’t go to school/work due to hazardous and/or limited transportation services. A day when you sleep in and then hang around the house and have a semi-productive-semi-lazy afternoon. A day when you turn on the news to see how the big event is affecting your city and the surrounding areas. However, the similarities stop there. When you go outside on a snow day, you either make snowmen and snowballs (if you’re a child) or suffer through the necessary shoveling (if you’re an adult). When you go outside on a strike day, things are quite different. Around 7:30 pm, a friend and I got on the metro, waited approximately 15 minutes (instead of the usual 5) for the next extremely crowded train, and headed toward the center of Madrid. We expected that things would have been calm by this hour, and at first glance, we were completely right. The remnants of the strike were visible, with stickers and posters covering the streets, but people were calmly strolling through the streets or grabbing bites to eat and nothing seemed particularly out of the ordinary. We even went into a few shops before sitting down by a fountain in the middle of Puerta del Sol, the heart of the capital, to wait for another friend. Things remained normal as the three of us walked through the streets in the center and made our way to a bar to get some drinks and bite to eat. After enjoying our dinner, we went to leave, just as a waiter was closing the door to the bar, saying that there was jaleo (commotion) outside. Right in front of our eyes, two 20-somethings were being detained, face-down on the ground with their hands tied behind their backs, surrounded by at least ten policemen in SWAT gear. About ten minutes later, even more police arrived and took the detainees away in police vans, at which point we went to talk to some of the other onlookers who had seen the beginning of the incident. It was still unclear, however, exactly what the protesters had done. Some say they did nothing. Others say they had explosives. We left Plaza Santa Ana thinking we were still in the clear, discussing what we had just seen while pondering a stop for frozen yogurt. As we walked down a side street, just before entering Sol, the fro-yo talk ceased and the jaleo returned: we heard a small bomb/firecracker explode in the plaza and saw the chaos that ensued (though it appeared to be due to shock rather than physical injury) — people running away screaming and the metal doors to the metro entrances rapidly closing. At that point, we decided it was time to get in a taxi and return to the calm neighborhood of Moncloa where we live. And that’s just what we did. So no, maybe I shouldn’t have gone to the center of Madrid tonight, but I will now forever remember 14N as much more than a 65-degree snow day. After living for four years next to “The City of Neighborhoods” and regretfully not getting to know enough of them (I’ll be back for you, Chi City), I knew I would not make that mistake again here in Madrid. Lucky for me, my new home could easily have the same nickname, “La Ciudad de los Barrios,” for Madrid is full of distinctive collections of streets worth exploring. In weeks past, I explored Lavapiés (filled with recent immigrants from all over the world) and La Latina (“traditional Spanish” and known for its abundance of excellent tapas bars). More recently, I have ventured to Malasaña (funky and eclectic with retro and international restaurants; former home of the movida movement — a post-Franco “coming out” against the taboos of the dictator’s regime), Chueca (known as the gay neighborhood) and Triball (“The Soho of Madrid;” a “new” neighborhood that combines tributes to local artists with a foreign flare in food and design). And that’s just the beginning. Sometimes, experiencing culture means having long compare-and-contrast conversations about Spanish and American politics, customs and attitudes. Sometimes it means getting lost on winding roads and not caring where you end up. Sometimes it means ordering tapa after tapa even when you’re not hungry anymore. Sometimes it means hearing your landlady tell you her life story for the fifteenth time in less than two months. But sometimes, it means going to a Simple Plan concert. On Friday, I went with a friend to the Coca Cola Music Experience, a 7-hour macroconcierto featuring a number of middle-of-the-road Spanish artists leading up to the two headliners. 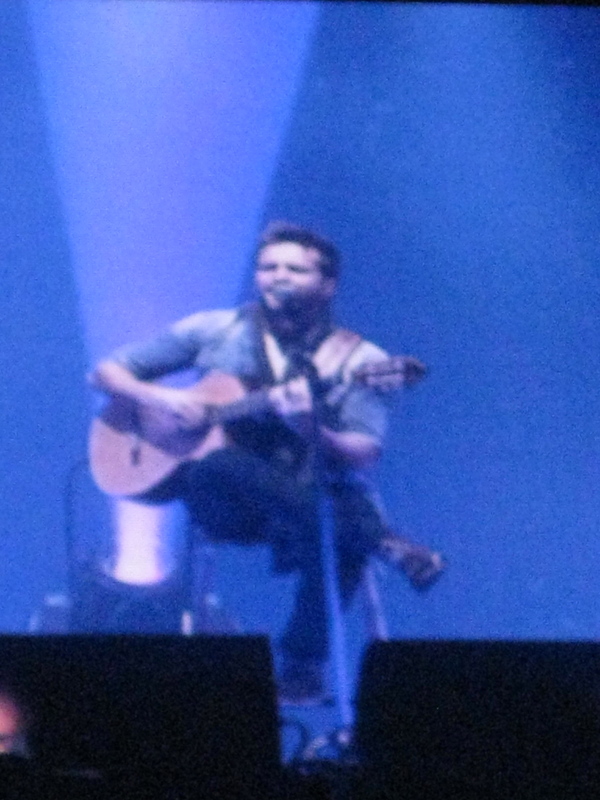 I was there to see the second, Pablo Alborán, who I will tell you about in a minute. However, to get to that point, I had to stand through, among others, an hour-plus set from Simple Plan. During my preteen years when I thought the whole world was out to get me, the Canadian pop-punk quintet’s oh-so-eloquent lyrics (“I’m adic–I’m addicted to you,” and “It feels like you don’t care anymore / I just want to make you proud / I’m never gonna be good enough for you”) were figuratively etched in my heart and literally typed in my AIM profile and away messages. I have come a long way since then, thank God, and I’m pretty sure there are actually very few people in the US who still enjoy their music. However, Simple Plan still has a pretty solid following here in Spain, and because of that, I had the distinct pleasure of hearing them perform live. I’m proud (humiliated?) to report that some of the lyrics came right back to me, and I may have even sang along. However, the highlight of the night was the incredible set of Pablo Alborán, a gorgeous singer-songwriter from Málaga who, at the age of 23, already has three Latin Grammy nominations and various other forms of recognition. I suppose you could categorize his music as Latin Pop, but it is much more than that…deeper and more soulful than your typical pop song, laced with riffs of flamenco, and supported by a beautiful voice and above-average guitar and piano skills. Basically, he’s damn good. And well worth hours of opening acts and Simple Plan. The concert also included a make-your-hair-stand-on-end moment when the DJ asked everyone to hold up their cell phones or anything that glowed and to sing along to “We Are Young” by fun. to remember the lives lost in the human stampede at a Halloween party in Madrid the week before. Ah, the long-coveted magical Madrid Metro abono. What is an abono, you ask? 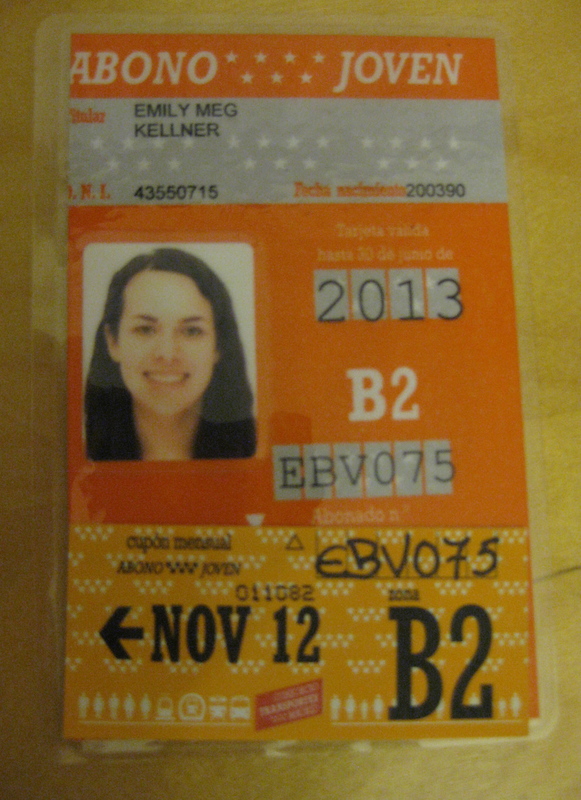 Well, that would be my unlimited metro, bus and Cercanías (short-distance train) pass for the month of November. For the low price of 43 euros per month, which I’d spend on my commute to and from work alone, I can hop on and off any of the aforementioned forms of transportation in the city and its surrounding towns without worrying about spending money. A pathetically elementary mathematical error stopped me from purchasing one for October (let’s not talk about that…), but November has arrived, and with it has come a recurring wave of giddiness every time I pull my bright orange abono from my purse and swipe into the metro or bus. To top it all off, I am lucky enough to qualify for the reduced-price Abono Joven (youth pass), which is valid until June 30th of the year in which one turns 23, a date that just so happens to be the last day of my contract. All hail to the abono.